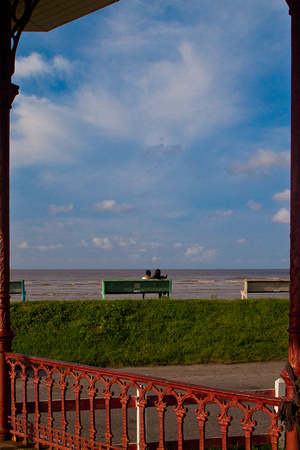 I liked how this particular image came out, not necessarily for art, but for the framing of the couple on the bench. It’s one of those Georgetown Seawall scenes that can be somewhat iconic. This scene brings to mind the song by Dave Martins and the Tradewinds entitled “In Guyana”, it’s mostly of a time gone by, and mostly even before my time, but some of it pulls at my heartstrings. I like the framing but would like to see a little more roof (a minor thing). It almost looks like the person on the right is pointing at something, really cool! Beautiful scene, it really is iconic. I don’t think any Guyanese can fail to recognise this one, no matter where they came from or where they ended up. Nicely done. Nice framing. It’s nice to see the warmth in other parts of the country. What if you took the picture from a different angle, by sitting or kneeling and using the red fence space to somehow frame the benches. Just a thought. Very nice framing and layering in this shot. Like the shot, but would have to disagree that no roof in the photo might give more focus to the subject rather than letting you eye drift away. Just my two cents. Hi Michael, I, too, find the upper left of the picture a little distracting. Maybe if you could have zoomed closer to eliminate that, or possibly cloning out that part? Otherwise, i really like the picture.